A couple of the staff have found jobs; some are retiring; and others are still looking. 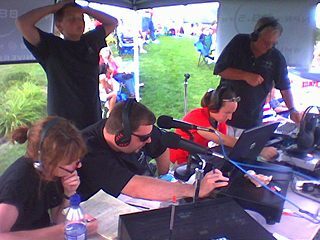 The picture is a typical WMUB live remote — this one from a Red, White & KaBOOM! Independence Day celebration in Fairfield, OH a few years ago. L-R, Cheri Lawson, Jay Hingsbergen, Ben James, Tana Weingartner and John Hingsbergen.